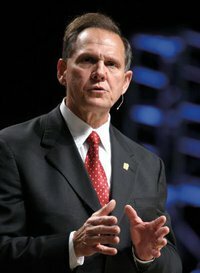 You remember Roy Moore. He was the Alabama judge who was challenged by the ACLU for posting a copy of the Ten Commandments in his courtroom and began jury deliberations with a prayer for divine guidance. He became the personification of the movement in the United States to reduce the wall of separation between Church and State. Most people assumed that he has returned to well-deserved obscurity. Well guess again. As of last night, he is again the Chief Justice of the Alabama Supreme Court. Moore was not only known for his contempt for separation principles (a trend that I have written about) but his contempt for basic principles of the rule of law. He was removed after refusing to obey a federal judge’s order to remove a 5,200-pound granite Ten Commandments monument from the lobby of the Alabama Judicial Building. He was later investigated for the misuse of funds of Coral Ridge Ministries for his defense (though no charges were filed). I’ll still love her even if she doesn’t love me.She’s under the weather.It appears to be a true story. Do you realize that all of these shirts are half off?I’m On your side.It sounds like you enjoyed itIt sounds like you enjoyed itYou should look at it yourself.Yes，I suppose So.What we read influences our thinking.